In February of 2017, the Maui News released a story on how Maui’s Wind Farms are seeking an increase in their permitted number of Hoary Bat and Nene fatalities. At the time of the story’s release Kaheawa Wind Power II had already exceeded their bat “takes” and Hawaii’s five major wind farms combined had already killed 146 out of the allowed 180 endemic bats…only five years into their 20 year permits. Nene fatalities at just the Kaheawa Wind Power I (on the high slopes above Maalaea Harbor on Maui) reached 41 since 2006. Not much is known about the Hoary Bat, or ‘ope’ape’a, aside from the fact that it is Hawaii’s only native land mammal. It was listed as federally endangered in October 1970 and still, no one really understands the population dynamics of this species. It has been spotted on Maui, but the population here could be 50 or it could be 500; scientists have not conducted population surveys. This lack of knowledge on population counts makes it incredibly difficult to approve increasing the permitted fatalities. The state of Hawaii has already been dubbed “the extinction capital of the world” so this topic is incredibly relevant. -A place that makes up only .2% of all US lands but contains 25% of the nation’s federally endangered species? Yes, this is the place that needs to come alive when these discussions begin. -If scientists have not established “total population” it seems impossible to be able to gauge whether increased fatalities will be minor. 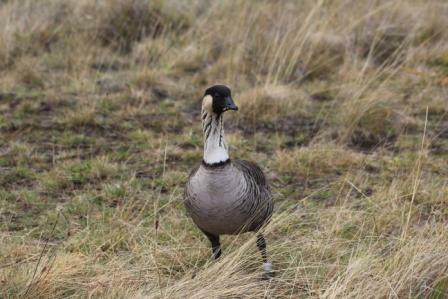 The Hawaiian Goose, or the Nene also suffers fatalities from the Wind Farms and this bird was listed as endangered in 1967. Kaheawa Wind Power I on Maui is permitted 30 incidental Nene deaths between 2012 and 2032 and as of October 1, 2017, they had already killed 11. The avian mortality “surveys” entail Wind Farm employees searching the ground around the turbines once or twice a week. As humanity tries to find alternatives to fossil fuel dependence, wind power becomes quite appealing, especially in a place where pretty much on a daily basis you can feel the tradewinds pick up as the sun warms the land. As these giant turbines are mistaken for roosting sites and pose collision issues to our endangered bats and birds, that might be something to consider even more…the sun.